Earlier this year Sascha Matuszak begun working on a documentary film, The New Masters, about how traditional Chinese kung fu is colliding with the worldwide sport of mixed martial arts (MMA). In the months that followed, spent a lot of time onthe road meeting cagefighters and martial artists, and writing about them for Fightland, an online MMA blog created by the well-respected Vice Magazine. In other words, Sascha has earned his place as an authority on the topic of kung fu and MMA in China, putting him in a great position to take his documentary, The New Masters, to very exciting places. This interview is to find out more about the documentary, which is still in production, and learn about the Kickstarter campaign for the film which launched only 24 hours ago. Chengdu Living: What is the New Masters? Sascha: TNM is a documentary film that explores the meeting of Kung Fu and MMA in Mainland China. Kung fu has a long, storied history as a martial art, but MMA is a relatively new phenomenon, in terms of mixed martial arts in the modern sense. MMA has landed on China’s shores quite recently, and has made an impact. We explore how the existing martial arts community is dealing with this new phenomenon, MMA, which has become a global force. We are learning about how these characters interact with the changing environment – like a Shaolin monk who wants to compete in MMA, an MMA fighter competing in the UFC who’s struggling to for financial security, and others. On a broader level, the film discusses the meeting of old and new, and how China is discovering its own martial arts identity. C: What gave you the idea to start TNM? Sascha: The Last Masters is a book project that I’ve been working on for two years. While doing research for that book, I met two film makers at the Shaolin temple, Chris Cherry and David Dempsey, who were following up on a story that I had written about MMA in China (The Hard Knock Life of a Foreign Fighter in China). When we met, we really hit it off, so we decided to cooperate and create something bigger and more meaningful together. I’ve been engrossed with kung fu for a decade, but have only a little experience making movies, these guys were skilled videographers who knew little about Chinese kung fu. It felt like a good fit. So after meeting Chris and Davie, the Last Masters became the New Masters. Chengdu Living: Who are the new masters? Sascha: The New Masters, I think, are a new breed of Chinese martial artist. They incorporate mixed martial arts into their training and they train in gyms, as opposed to kung fu schools of China’s past, for example. Fighters from the newer generation utilize a lot of China’s traditional martial arts methods, in execution and in training, while incorporating international martial arts that we all know now through MMA, like brazilian jiu jitsu. This is really just an entirely new breed of Chinese martial artist. Chengdu Living: Who are the main characters in The New Masters? Sascha: There are four major characters. 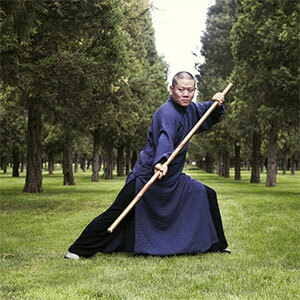 The first is a Shaolin trained martial artist who goes by his Buddhist name, Xingxi. He is something of a classic kung fu character. He trained under a master on a mountain behind the Shaolin Temple, wears robes, drinks tea, quotes the classics, practices Qi Gong … Xingxi is now on a journey to compete in MMA and prove that kung fu is useful in the modern world of combat sports. Next is a Canadian MMA fighter named Vaughn “Blud” Anderson who recently retired from competition. He’s an O.G. China MMA fighter, who’s been here since the beginning and is well known in the Asian MMA community. He’s like our Virgil in the story – he guides us through the landscape of competitive Chinese martial arts. The third character is a man named Ning Guangyou – a competitive Chinese MMA fighter. He comes from a poor background and has worked odd jobs to finance his fight career. He’s just made it to the UFC and has become the TUF (The Ultimate Fighter) China Featherweight champion. He’s a success story in Chinese MMA and he represents the new masters. He studied Wushu as a child and encapsulates a lot of the traditional elements and has found success in these new arenas. The last is a woman named Zou Fan, who more closely represents the last masters, and the impact that they can still have on the martial arts community. She was a bare knuckle fighter – she’s a tough woman. Now she practices Taoist Qi Gong in the mountains of Chongqing, in a kung fu retreat that she built herself. She’s a personification of the classic Chinese kung fu dream – a master living in the mountains, training daily, working toward enlightenment. Even in the modern MMA landscape, these characters still exist. Chengdu Living: How does kung fu fit into the MMA lanscape? Sascha: Kung Fu is perceived by outsiders as an ineffective fighting style. But the philosophy of kung fu underpins almost all martial arts around the world: self improvement, discipline, honor, self-defense. These are part of the kung fu tradition. So as a philosophy it has great impact, but purely as a fighting style, it’s perceived as weak. Through the characters in our story, we ask questions like, “Is kung fu only valuable as a philosophy, or does it have practical value?” We let the characters answer these questions. Chengdu Living: Why is kung fu perceived as weak in MMA? Sascha: Up until now, any fighter who has claimed kung fu as their background has been embarrassed in the ring when fighting against other styles. I don’t think it’s necessarily because it’s ineffective, but maybe because no truly great kung fu master has achieved a high level of success in MMA. Kung fu also sorely lacks ground offense and defense. As anyone who watches MMA knows, ground defense is crucial, and having no ground game is not an option. In general, kung fu has proven itself to be a little inflexible in how it can fit and exist with other martial arts, unlike Thai or Brazilian martial arts. Chengdu Living: What does the Kickstart campaign enable you to do? Sascha: Up until now, this project has been self funded. We seek support to help us travel to distant regions of China and film, upgrade our equipment to better capture scenes, and for a lot of other things, liketranslation of documentation and research, and so on. The Kickstarter allows us to resume filming and compete the project. On the Kickstarter page there’s an itemized list of things required. Chengdu Living: What’s the goal of The New Masters? Sascha: We hope to give people a clearer picture of the Chinese martial arts landscape. It’s not just old kung fu guys in temples. It’s strong, powerful men and women living in the sticks, working hard, training hard, to try and make a living. We want to brush away some of the myths surrounding Chinese martial arts. I know I also want to help kung fu achieve it’s rightful place in international martial arts. To elevate it beyond just the derelict martial art that it’s often relegated to. As a group, we want to show how our ideas of what happens when China meets the world are more simple than the truth actually is. In reality, there’s a dynamic discourse between what China wants to be, what it is, what it can contribute to the world. Lastly, I want to give back. Some of these characters I’ve known for a decade or more. They inspire me and I want to give back by showing people how beautiful and deep this culture is. I would like to show people how beautiful Chinese culture can be. People see Shaolin, but it’s not just robes and appearances – it’s deep and meaningful. Around 2010 I was with my kung fu master Li Quan how I was sorry for not having learned martial arts properly. I said, my kung fu is weak. He replied: your kung fu is in your pen. At that point, a light went on and I realized that I can give back to the community, not by pretending to be a martial artist, but by telling their story. Chengdu Living: What’s kung fu like in Chengdu? Sascha: The best place to go is still Li Quan’s school. It’s small, dilapidated and out in Flower Town, but it’s the real deal. He speaks English and he has students all the time, including foreigners. He’s a master in Emei style southern fist kung fu. In Dujiangyan there’s a prominent Taiji school run by a man named Liu Suibin. He’s famous and he has a Qingchen Taiji school. Other than that, there’s really not much that I know of. There are what are called Mingjian (??) kung fu teachers, which are like grassroots masters who trained under the old system. People don’t really study kung fu like they used to, so today these types are quickly disappearing. They don’t have a market. But they’re out there. Chengdu Living: When is The New Masters going to be finished and where will it be available? Sascha: In 2015, hopefully summer. If you contribute to our kickstarter, the documentary will be available to you immediately upon completion. Otherwise, the distribution of the film is still undetermined. We’re doing screenings in cities around the world, including Chengdu, and we’re hopeful that we will get into some film festivals. Check out The New Masters website which will be updated with more information as we have it. Chengdu Living: Anything you’d like to add? Sascha: Thanks for reading, and check out our Kickstarter. You can help us a lot by contributing to the Kickstarter or even just sharing the link with friends. Really looking forward to Zou Fan’s story. Yeah her’s actually ties everything together, she was a fighter, practices kungfu, and is now on the path to the next level in a way, Really cool person. Definitely, she clearly appears to be the most fantastical character out of this set. The photo of her above looks like it’s from Crouching Tiger, Hidden Dragon. I had heard a little bit about this when it began production but I saw the trailer for the first time about ten days ago. It really blew me away. One component that was added since I first saw this get started is Vaughn Anderson, the Canadian fighter. With all these characters being fantastical, almost movie character types (especially Zou Fan), Vaughn helps make it relatable and anchor the story. The real crux of the documentary seems to be where China meets the rest of the world, and how the two can have a symbiotic relationship without kung fu completely dying out. It would be amazing to see someone effectively use kung fu in the MMA and gain some recognition for the art form, but part of me feels like if it were going to happen it would have happened by now. Kung fu being a beautiful and entertaining but mostly theatrical martial art is still enough, though. Actually, I think things that are used now in MMA can be defined as coming from kung fu. It’s not that kung fu is waiting for someone to represent, but that nobody gives kung fu any credit for anything in the ring because Chinese kung fu chose films, money, and performance over fighting. I look forward to seeing more on Xingxi’s journey to prove Kungfu in the world of MMA. This will be an enthralling documentary. This is great! Hope many people can help fund the kickstarter. Love to see this documentary. There is definitely an illusion of Chinese Martial Arts, hopefully this will shed light on what is fiction and non. Hope one day someone with a Kung-Fu background would compete in MMA and show their skill sets. Yeah, donate whatever you can. We have some cool rewards on there – 50 bucks gets you a dope t-shirt or a photobook from the road, but any help is really cool. this looks dope as hell! Kung fu dude best get his choke defense ready son! i will definitely be checking this out when it comes out! The combination might look spectacular but in the end it’s not pure kung fu and it’s not pure MMA, the already classic style. In the end it’s about brutality. While kung fu was some sort of art mixed with life. Did you know that Bruce Lee; was a poor swimmer; had poor eye-sight; and could NOT ride a Bicycle. Also; his elder-sister Agnes used to beat him up as a kid; thereby; he developed a phobia to swimming! He also; had one undescended testicle. More; info. than u would want perhaps! I love MMA, how is the documentary now?